As well as hosting Waltham Forest’s longest running (around 30 years!) vegetarian (now vegan) cafe from Tuesday to Sunday, the Hornbeam runs a wide variety of events for and by the community based around promoting sustainable and low cost living. Please check events and social media for changes in the schedules of regular activities during August. Community Mondays and Hornbeam Nights will be taking an August holiday break. Food Rescue Kitchen: drop-in opportunities to learn to cook vegan food or just to eat. Cook from 10am, eat 1-2pm. We run pay-as-you-feel food stalls around the borough as part of this project providing food that is perfect to eat, but won’t be sold by shops as it’s near it’s ‘best before’ date. Hornbeam Nights can be put on by anyone who has an idea for a talk, film, pop-up Supper Club or music on Thurs, Fri or Sat nights. JoyRiders: we run a cycling group in Walthamstow for women only and one in Chingford for families. We also hold occasionally discussions or exhibitions at both locations. Family activities: We have lots of activities at the Hornbeam and the Learning Lodge using craft, food and nature to entertain, including the regular Sunday Family Club. Supporting community building: We regularly hold events which give support to people who need a space to meet, such as the Stories and Supper Clubs which occur regularly to give refugees and migrants a chance to meet, learn and tell their stories at the Supper Club events . 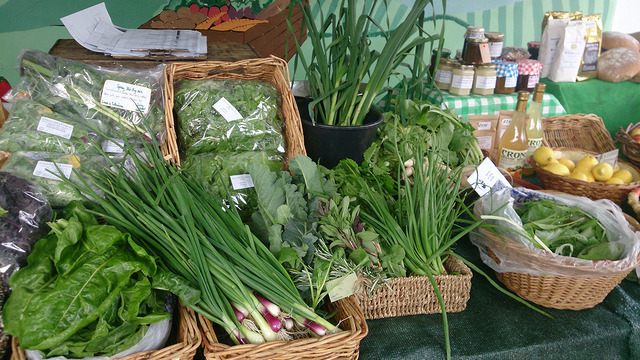 OrganicLea’s Market Stall: every Saturday 10am-3pm our partner Organiclea, run a food and veg stall outside the Hornbeam cafe. The market stall sells organic and ultra-local sustainably grown fruit and vegetables, plus homemade bread, jams and preserves. Another stall is held in Leytonstone outside Matalan. More regular events also happen at our Learning Lodge in Chingford.